The risk of developing ovarian cancer can be reduced by drinking tea, a team of Swedish researchers says. Karolinska Institute researchers found drinking at least two cups a day cut the risk by nearly 50%. Antioxidants in tea are thought to be the reason. The team quizzed over 60,000 women, 301 of whom developed ovarian cancer. The Archives of Internal Medicine study said more research was needed, and UK experts added there was still no proof of the benefits. Previous research has shown tea helps to protect against several types of cancer, and boosts memory. But the Swedish study is the first to specifically examine the relationship between tea consumption and ovarian cancer risk. Each year about 6,900 women in the UK are diagnosed with ovarian cancer, with more than 4,600 deaths annually. Ovarian cancer is also the fourth most common cause of cancer death in women in the UK. Researchers questioned 61,057 women aged 40 to 76 about their eating and drinking habits between 1987 and 1990. The women were followed up until December 2004 to see if they got cancer. The research revealed that 68% of women reported drinking tea - mainly black tea - at least once a month. During the study a total of 301 women were diagnosed with ovarian cancer. Researchers said they saw a 46% lower risk of ovarian cancer in women who drank two or more cups of tea per day compared with those who did not drink tea. 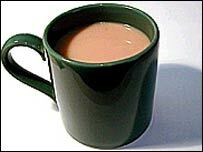 Women who drank one cup of tea a day had a 24% reduced risk, while those having less than one cup had 18% less risk. Lead researcher Susanna Larsson said they had found no link between coffee consumption and the risk of ovarian cancer, but added more research was needed. "In summary, our results from a large population-based cohort of Swedish women suggest that tea consumption may lower the risk of ovarian cancer. "Because prospective data on this relationship are scarce, our findings need confirmation by future studies." Professor Tim Key, professor of epidemiology at Cancer Research UK, said: "The risk for ovarian cancer is strongly related to hormonal factors - risk decreases with each child a women has, and risk also decreases the longer women take the oral contraceptive pill. "As yet there is no clear evidence that diet affects the risk for this cancer, and although these new results sound interesting they do not provide firm evidence that tea drinking has any effect on the risk for ovarian cancer."